No game preview today, I have to take a moment to discuss the Sox story that broke earlier in the day. The crazy news that broke earlier this morning regarding the television voice of the Boston Red Sox. Don Orsillo, who's been with the team for 15 seasons, will be calling his final game with the team at the end of this year. 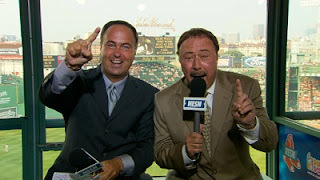 As bad as this team has been in the past couple of years and even when he first started, you always were entertained and informed by Orsillo who truly captured the right perspective of what was going on during the game. He's obviously been around to follow the ultimate highs for this franchise when they won it all in 2004, 2007 and 2013 as well as a bunch of no-hitters. But Don really set the tone perfectly for any game, big or small, over his tenure at NESN and was always welcomed in many people's homes throughout New England. Quick story; this past weekend I was down the Cape at my grandmothers house. Of course, we have always found a way to tune into the Sox game and this past weekend Don and Jerry, as is most of the time, had an opportunity to go "off script" for a bit. As they giggled and discussed sideline reporter Gary Striewski's non-haircut, my grandmother chimed in and wondered aloud if they had a couple of drinks because of how loose they sounded. We all exclaimed at how this was Don and Jerry at their best, making light of a situation that should be fun while still covering the game. My family has always enjoyed it and so have I. It's the small details that Don was able to enjoy the most while covering Boston's beloved team. Good luck Mr. Orsillo in your next endeavor! You are great at what you do every night!